Strudel Sticks | What about this? 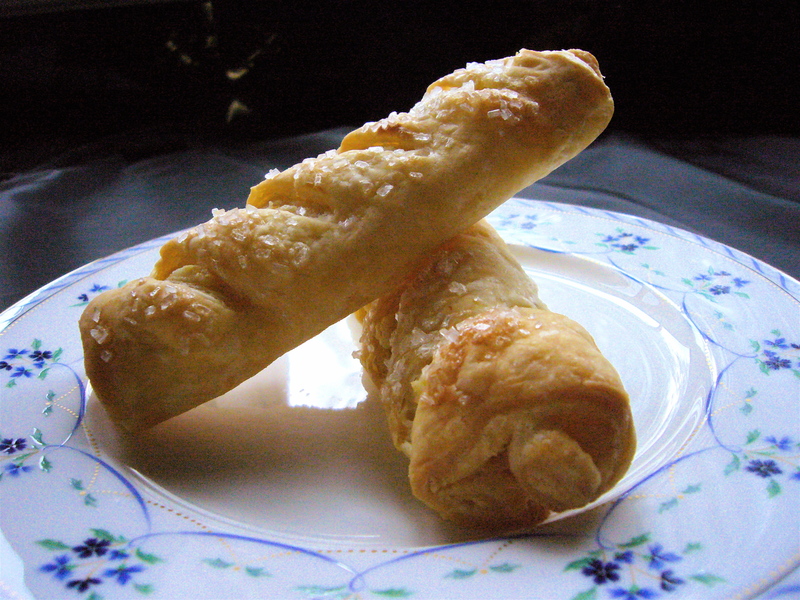 Strudel Sticks are delicate bits of puff pastry wrapped around a refreshing lemon cream cheese filling. Great as a breakfast finger food, unless you have manners and insist on using a knife and fork! They are delicious and so easy to make you’ll want to find excuses to make them! Brunch anyone? In a small bowl combine cream cheese, sugar, and lemon zest. Set aside. 1. On a lightly floured surface unfold pastry sheets. Cut each sheet into 5×3-inch rectangles – this is approximately cutting each sheet into six rectangles. 2. Brush edges of rectangles with a little water. Instead of getting out a pastry brush, I just dip my finger into a bowl of water and trace around the perimeter of each rectangle. 3. Place about 1 tablespoon of filling onto each rectangle and spread to within 1/2-inch from edges. This is done easily if you first dip a finger into water to prevent the filling from sticking to your finger and then gently spreading the filling with your finger. 4. Roll jelly roll style, starting from the long side. 5. Pinch edges to seal the seam. 6. Place pastry sticks, seams side down, on a baking sheet that is lightly greased or covered with parchment paper. 7. Make 3-4 diagonal cuts on top of each pastry. 8. Lightly brush with water and sprinkle with coarse sugar and almonds. 9. Bake in a 350 degree oven for 20-25 minutes or until golden brown. Serve warm or cool. These look delicious. I’ll make them for Easter brunch.